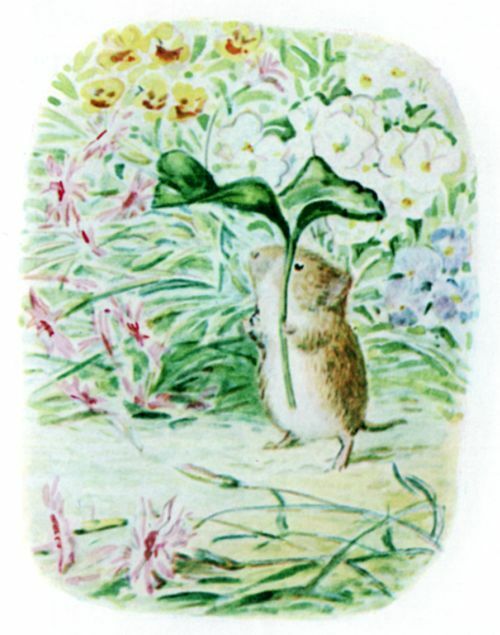 Johnny Town-mouse was born in a cupboard. Timmy Willie was born in a garden. 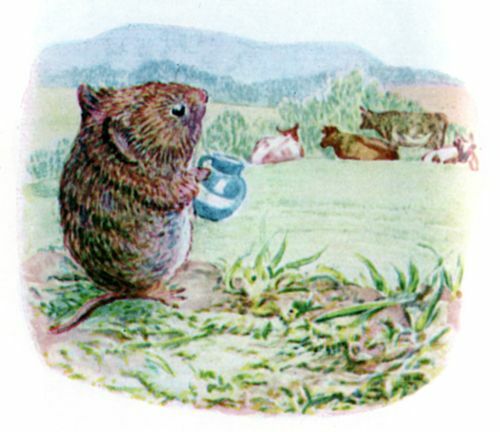 Timmy Willie was a little country mouse who went to town by mistake in a hamper. The gardener sent vegetables to town once a week by carrier; he packed them in a big hamper. 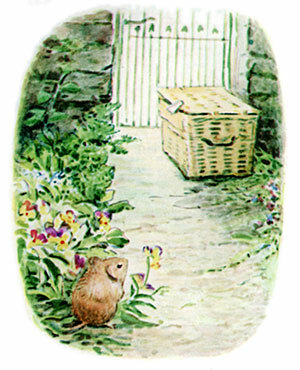 The gardener left the hamper by the garden gate, so that the carrier could pick it up when he passed. 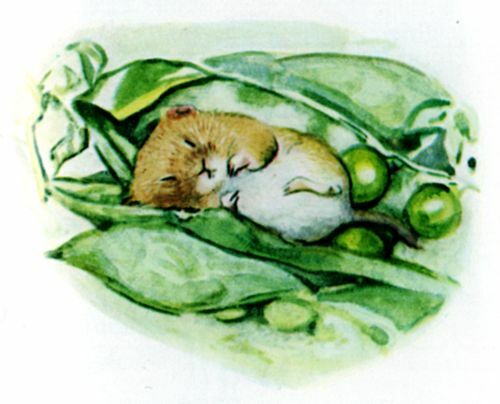 Timmy Willie crept in through a hole in the wicker-work, and after eating some peas—Timmy Willie fell fast asleep. 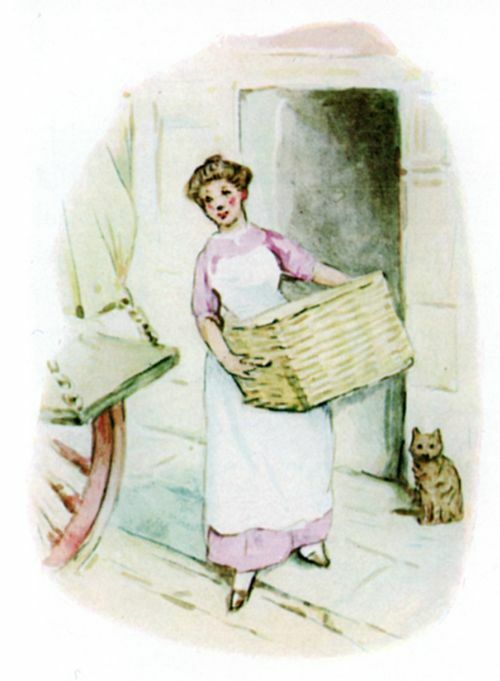 He awoke in a fright, while the hamper was being lifted into the carrier’s cart. 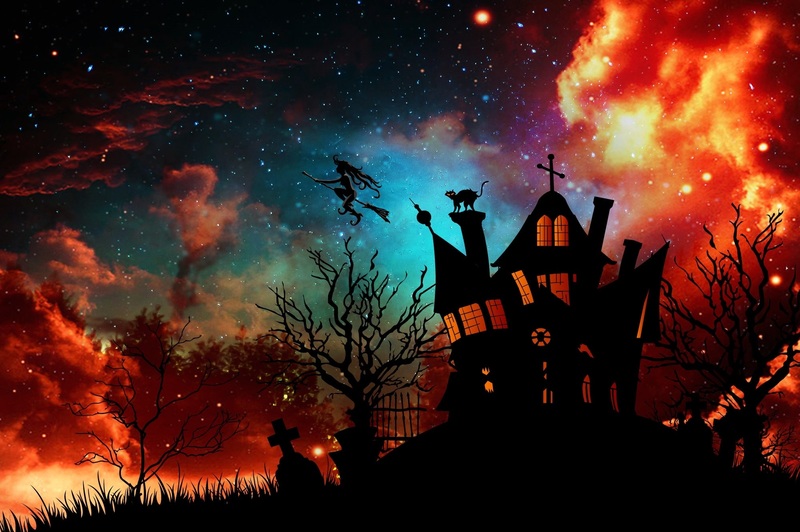 Then there was a jolting, and a clattering of horse’s feet; other packages were thrown in; for miles and miles—jolt—jolt—jolt! and Timmy Willie trembled amongst the jumbled up vegetables. 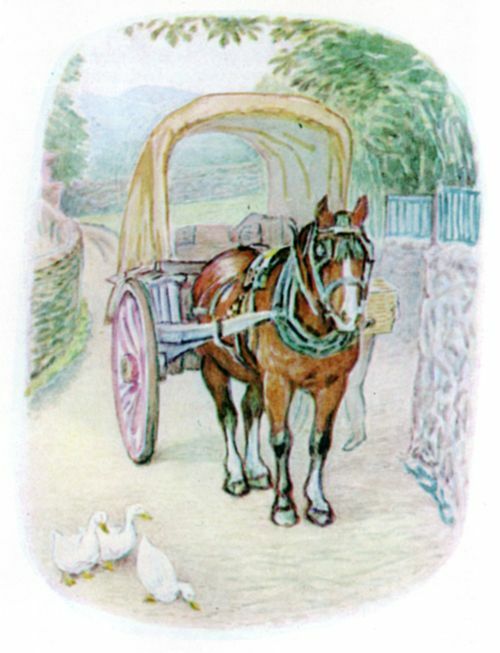 At last the cart stopped at a house, where the hamper was taken out, carried in, and set down. 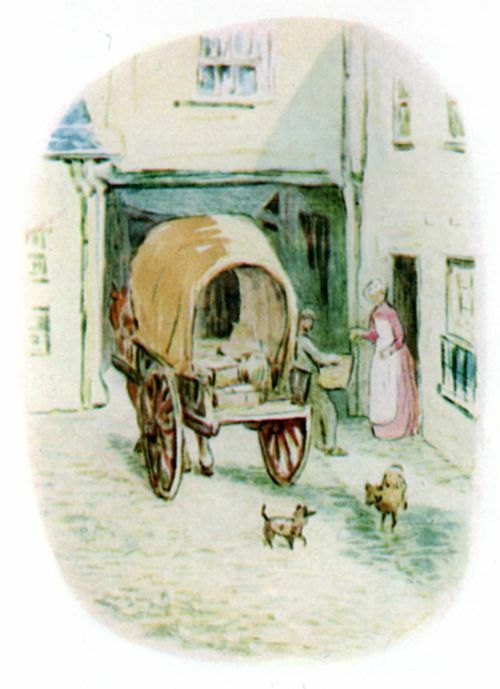 The cook gave the carrier sixpence; the back door banged, and the cart rumbled away. But there was no quiet; there seemed to be hundreds of carts passing. 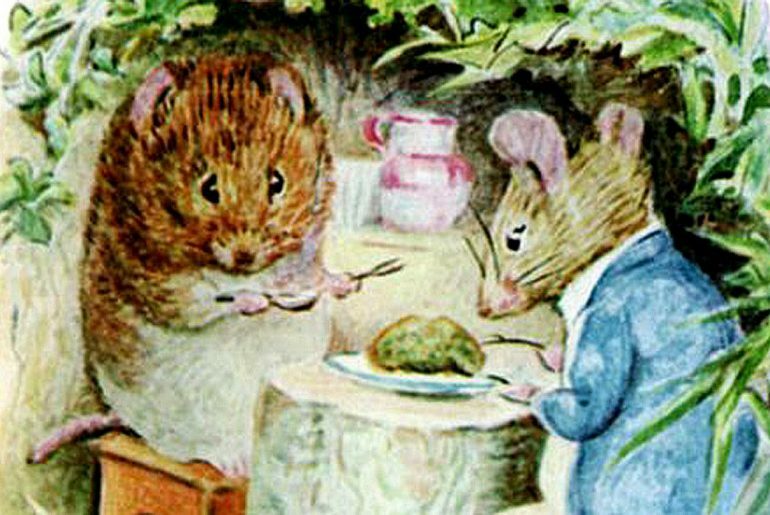 Dogs barked; boys whistled in the street; the cook laughed, the parlour maid ran up and down-stairs; and a canary sang like a steam engine. 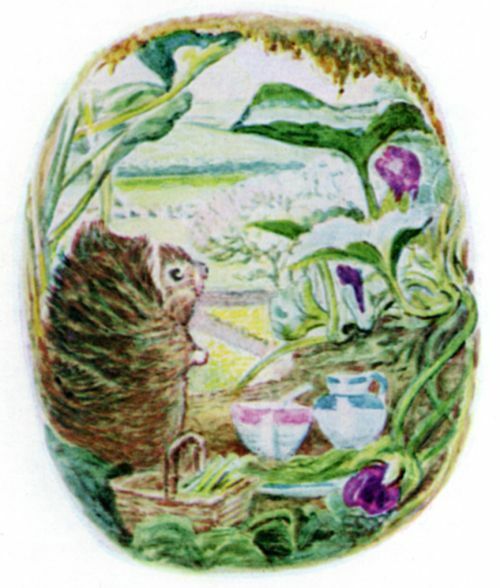 Timmy Willie, who had lived all his life in a garden, was almost frightened to death. 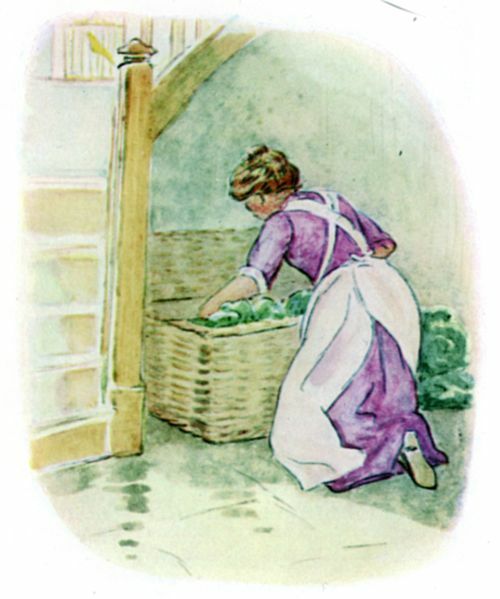 Presently the cook opened the hamper and began to unpack the vegetables. Out sprang the terrified Timmy Willie. Up jumped the cook on a chair, exclaiming “A mouse! a mouse! Call the cat! Fetch me the poker, Sarah!” Timmy Willie did not wait for Sarah with the poker; he rushed along the skirting board till he came to a little hole, and in he popped. 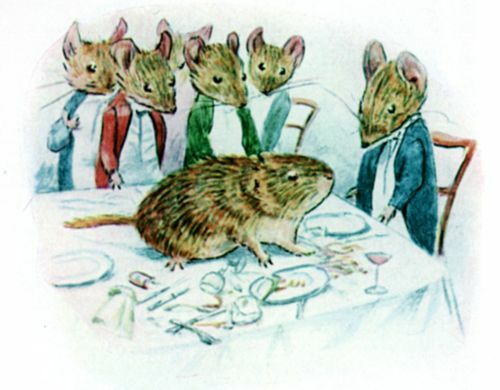 He dropped half a foot, and crashed into the middle of a mouse dinner party, breaking three glasses.—”Who in the world is this?” inquired Johnny Town-mouse. But after the first exclamation of surprise he instantly recovered his manners. 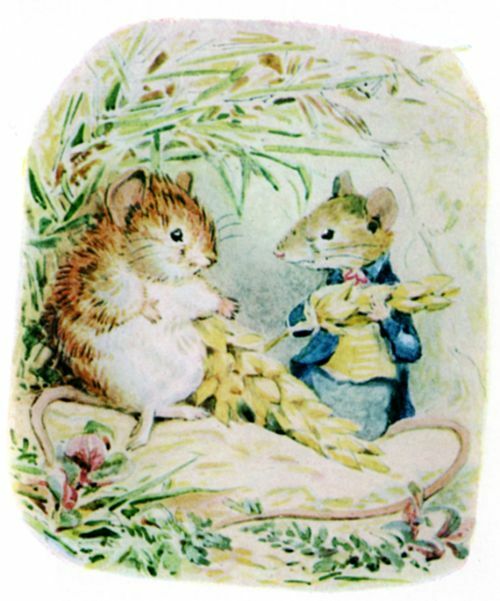 With the utmost politeness he introduced Timmy Willie to nine other mice, all with long tails and white neckties. Timmy Willie’s own tail was insignificant. 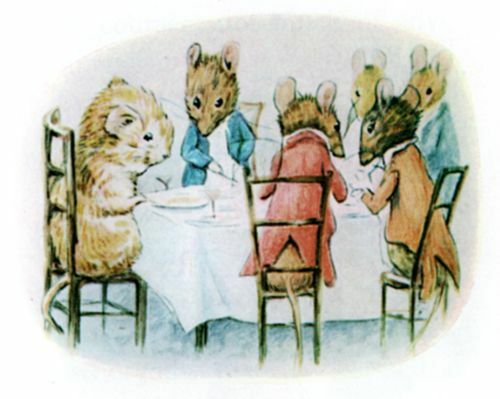 Johnny Town-mouse and his friends noticed it; but they were too well bred to make personal remarks; only one of them asked Timmy Willie if he had ever been in a trap? The dinner was of eight courses; not much of anything, but truly elegant. 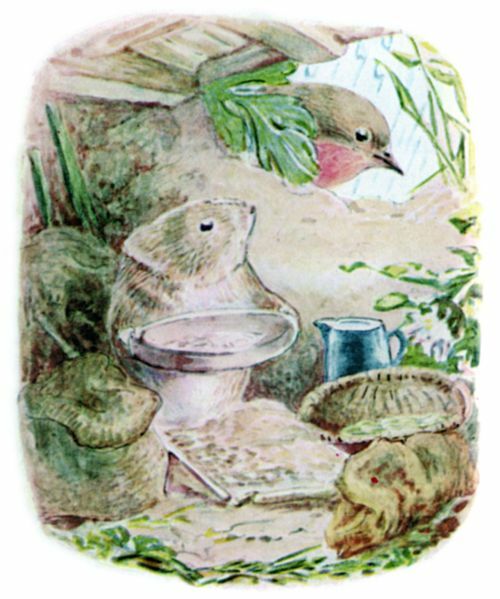 All the dishes were unknown to Timmy Willie, who would have been a little afraid of tasting them; only he was very hungry, and very anxious to behave with company manners. The continual noise upstairs made him so nervous, that he dropped a plate. “Never mind, they don’t belong to us,” said Johnny. 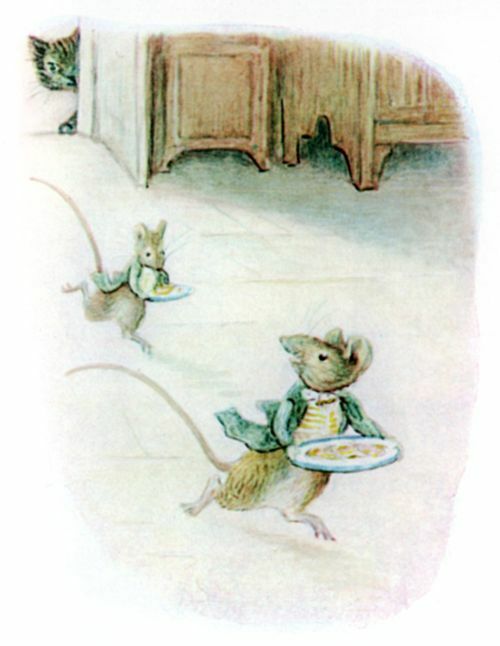 “Why don’t those youngsters come back with the dessert?” It should be explained that two young mice, who were waiting on the others, went skirmishing upstairs to the kitchen between courses. 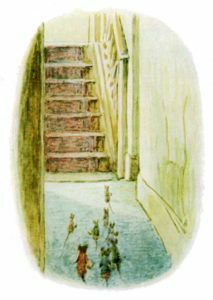 Several times they had come tumbling in, squeaking and laughing; Timmy Willie learnt with horror that they were being chased by the cat. His appetite failed, he felt faint. 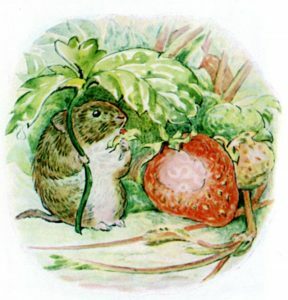 “Try some jelly?” said Johnny Town-mouse. The sofa pillow had a hole in it. Johnny Town-mouse quite honestly recommended it as the best bed, kept exclusively for visitors. But the sofa smelt of cat. Timmy Willie preferred to spend a miserable night under the fender. It was just the same next day. 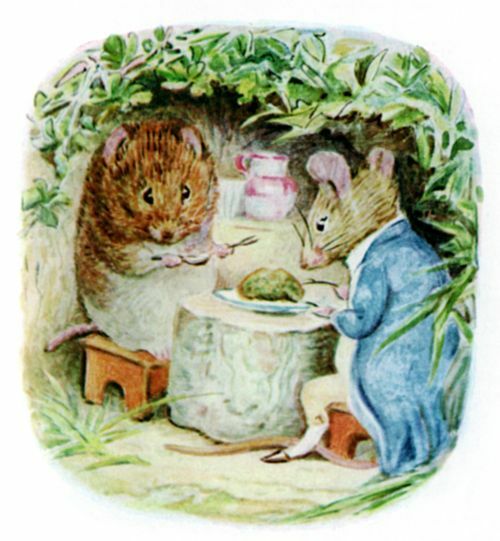 An excellent breakfast was provided—for mice accustomed to eat bacon; but Timmy Willie had been reared on roots and salad. 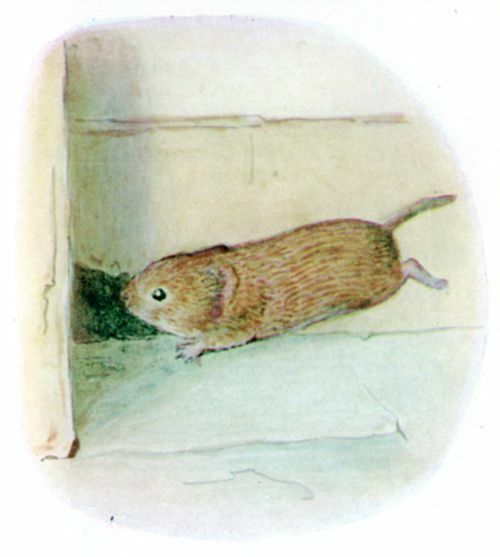 Johnny Town-mouse and his friends racketted about under the floors, and came boldly out all over the house in the evening. 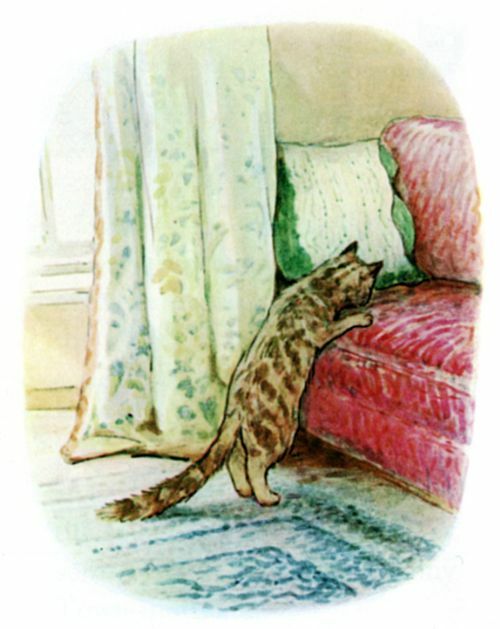 One particularly loud crash had been caused by Sarah tumbling downstairs with the tea-tray; there were crumbs and sugar and smears of jam to be collected, in spite of the cat. 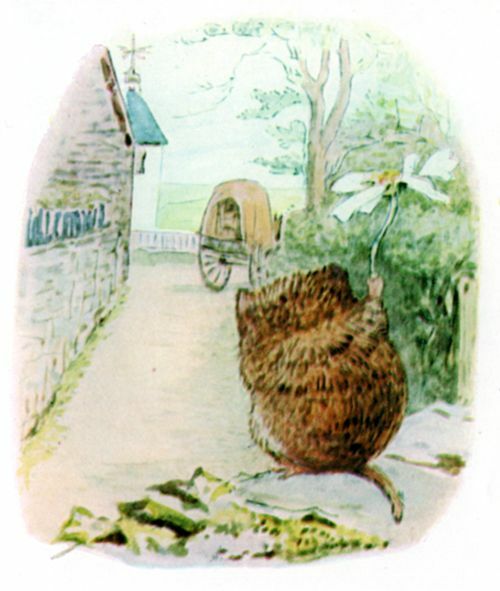 “Oh yes, yes, you have been most kind; but I do feel so ill,” said Timmy Willie. “Oh? Oh!” cried Timmy Willie. 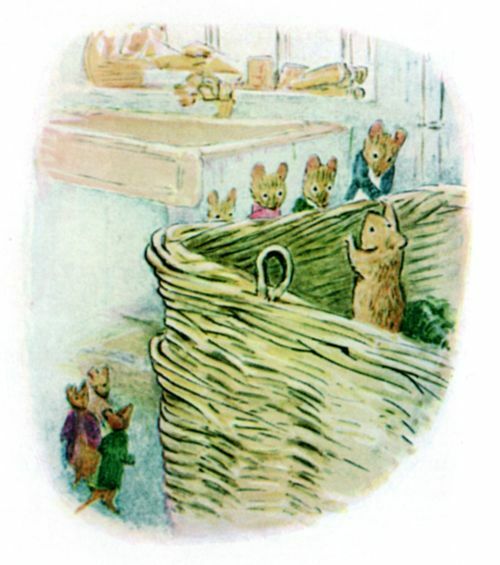 So Timmy Willie said good-bye to his new friends, and hid in the hamper with a crumb of cake and a withered cabbage leaf; and after much jolting, he was set down safely in his own garden. 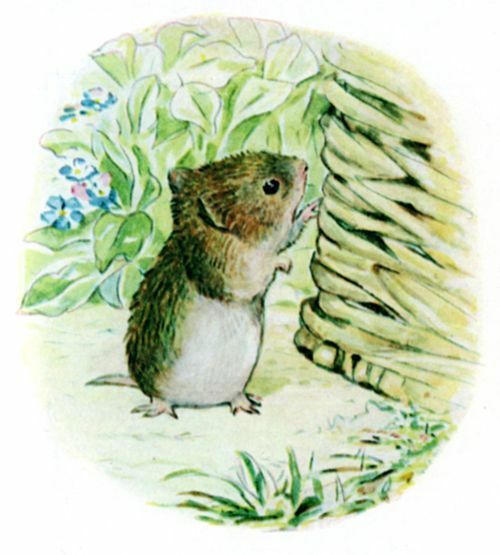 Sometimes on Saturdays he went to look at the hamper lying by the gate, but he knew better than to get in again. 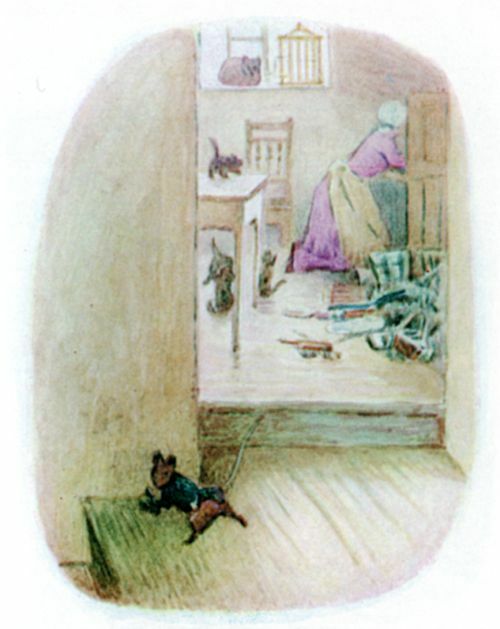 And nobody got out, though Johnny Town-mouse had half promised a visit. 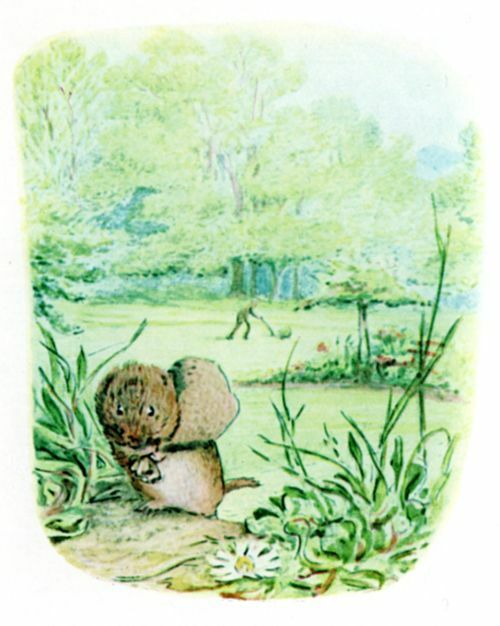 The winter passed; the sun came out again; Timmy Willie sat by his burrow warming his little fur coat and sniffing the smell of violets and spring grass. He had nearly forgotten his visit to town. When up the sandy path all spick and span with a brown leather bag came Johnny Town-mouse! “H’m’m! 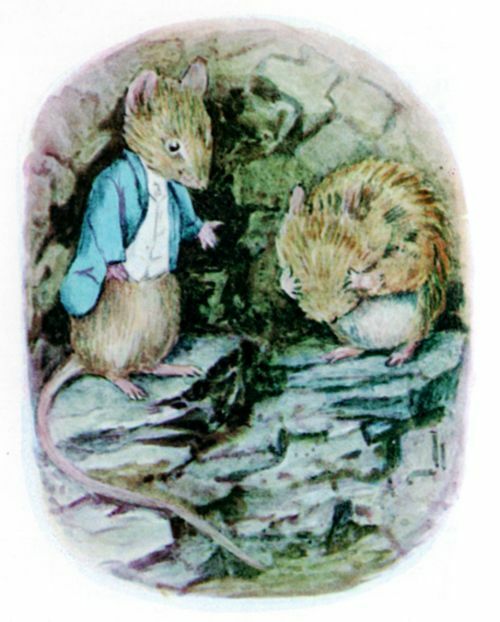 it is a little damp,” said Johnny Town-mouse, who was carrying his tail under his arm, out of the mud. “What is that fearful noise?” he started violently. Johnny’s account was rather middling. 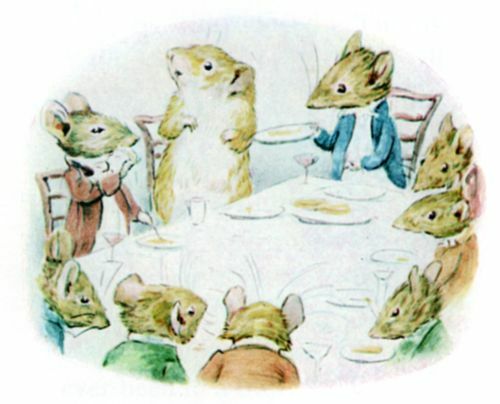 He explained why he was paying his visit so early in the season; the family had gone to the sea-side for Easter; the cook was doing spring cleaning, on board wages, with particular instructions to clear out the mice. There were four kittens, and the cat had killed the canary. “I am sure you will never want to live in town again,” said Timmy Willie. But he did. He went back in the very next hamper of vegetables; he said it was too quiet!! One place suits one person, another place suits another person. For my part I prefer to live in the country, like Timmy Willie. 1. 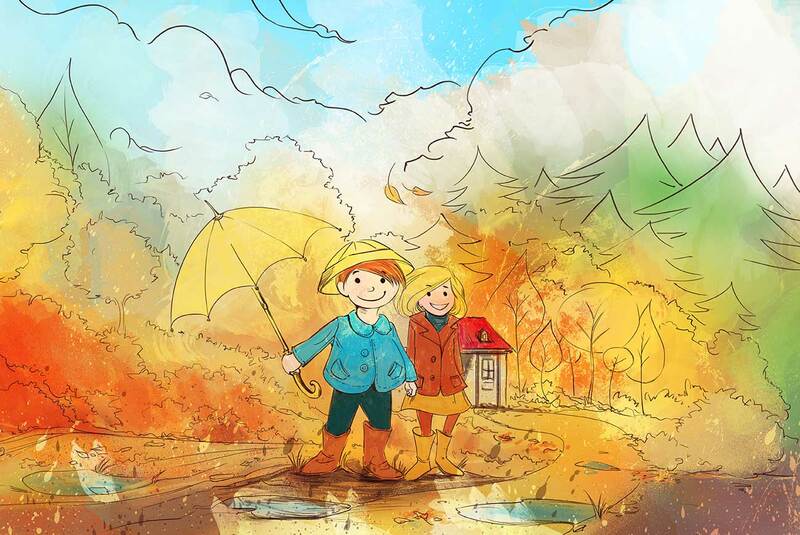 Do you live in the town, or the country? What are some of the nicest things about where you live? 1. Imagine someone who lives in a place very different to you. 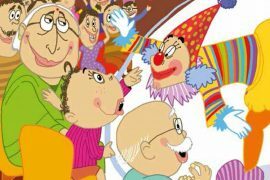 For example, if you live in the city, imagine a child who lives in the country. If you live in the country, imagine a child who lives in the city. What do you think would be good things about living in that place very different to where you live?